Revolutions in science often surpass the limited changes envisioned by their initiators, much as political and social revolutions do. Such is the case with the Copernican revolution. 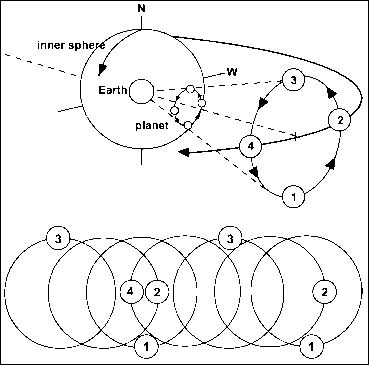 It began with a seemingly simple interchange of the Earth and the Sun in a geometrical model still composed of uniform circular motions. But Aristotelian physics, with objects falling to the Earth because of their natural tendency to move to the center of the universe (where the Earth was), does not work in a Copernican universe. The old physics would be destroyed and eventually replaced by a new, Newtonian physics. Other worlds, forbidden in an Aristotelian universe because their earthy nature would have caused them to move to their natural place at the center of the universe, now could be scattered throughout a Copernican universe. The revolution would also see the demise of the finite, closed, and hierarchically ordered universe of medieval belief. It would be replaced by an indefinite or even infinite universe consisting of components and laws but lacking value concepts: perfection, harmony, meaning, and purpose. No longer was the universe specifically created for humankind, which was further downgraded by the new possibility of many intelligent species scattered throughout the universe. The Earth was now but one of many planets similar in physical composition and possibly with similar inhabitants. As scientists were changing the physical view of the universe, other thinkers would radically alter political, sociological, and religious views of humankind's place and role in the new universe. Back on the physical side of the revolution, once the apparent motion of the stars was transferred from rotation of their sphere to rotation of the Earth, the outer sphere of the stars was obsolete. Only intellectual inertia discouraged speculations about newly possible distributions of stars throughout a perhaps infinite space and speculations about noncentral positions for the Earth and the Sun. Figure 15.1: Leonard Digges, A prognostication everlasting, 1556. 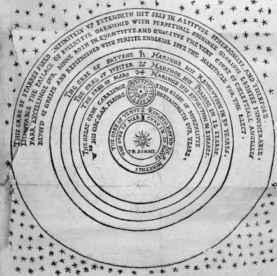 The ancient and medieval picture of the universe. The sublunar region consists of spheres of earth, water, air, and fire. 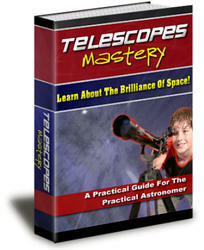 Beyond are the spheres of the Moon, the Sun, the planets, and the stars. Illustration from Leonard Digges, A prognostication everlasting. 1556. Image copyright History of Science Collections, University of Oklahoma Libraries. 1576. 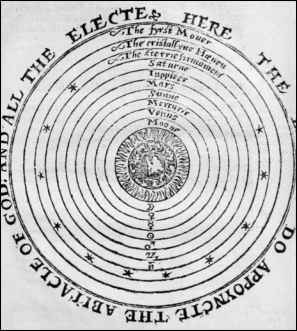 This diagram was added as an appendix by Thomas Digges to his father Leonard Digges' 1576 A prognostication everlasting, "to the end [that] such noble English minds (as delight to reach above the baser sort of men) might not be altogether defrauded of so noble a part of Philosophe." Illustration from Thomas Digges, A Perfit Description of the Caelestial Orbes. 1576. Image copyright History of Science Collections, University of Oklahoma Libraries.